Once you've figured out what type of sup roof rack you need for your car, you're one step closer to strapping up your paddleboard. But there are still some maintenance items to take care of on your paddleboard before you throw it on your roof. Paddleboard Bags: You should consider putting your board in a paddleboard bag or paddleboard sock before strapping it up. This might be overkill in some situations, no doubt (like a quick trip), but a lot of times it will be beneficial for your paddleboard. At the least the bag will save your paddleboard from some sun exposure that can age the fiberglass or other materials that your board is made out of. It will also provide a layer of protection from the general debris that flies up off the road (rocks, dirt, trash, etc.) or from the car in front of you (cigarettes). Also if you’ve waxed up your board and it’s hot out your wax could melt and run, even with the board facing down, but that generally won’t happen if it’s in a bag. Fins: We suggest that it’s best to leave your fins in your paddleboard on a road trip as they can act as a last line of defense against your paddleboard flying off your car. Imagine your straps getting loose, and with the direction of your car forward, your SUP starts to slide backward a bit. 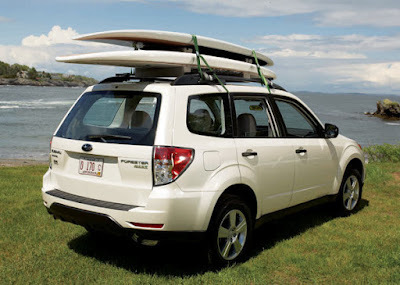 At some point, the fin sticking up in the front of your car will catch on the straps and prevent your paddleboard from sliding any further backward. Depending on whether you’re stacking a few paddleboards on one another, you’ll have to watch how you stagger them backwards to make sure your rack can support them all properly.